The bell in this archway reminds me of some of the California mission bells I have seen. I pass it often as we head to Furman Park for a walk. Somehow it has a sense of history, just the look of it. I remember how fun it was to follow the mission bells of the El Camino Real for a mission trip when my daughter was in the 4th grade. 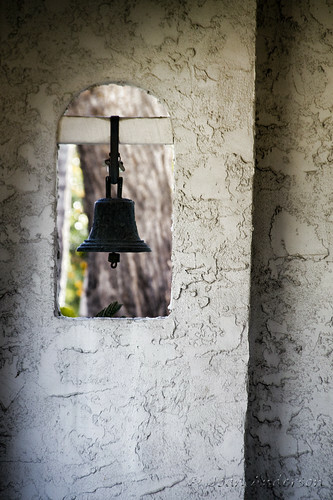 Although the missions date back to 1769, the mission bells that guide you along El Camino Real were not in place until 1906 when a cast iron 85 pound bell was placed into the ground in concrete at the Iglesia de Nuestra Senora Reina de Los Angeles, also known as the Plaza Church near Union Station in Los Angeles. I don't know if this bell that I pass almost daily has any historical significance, but it is appealing and reminds me often of the heritage we have in California.